Biologist Alexis Carrel once said "man cannot remake himself without suffering, for he is both the marble and the sculptor." He'd like Pavlok, we'd wager. Pavlok is a 'habit-forming' fitness wearable that looks to shock you if you're not keeping up with your goals. 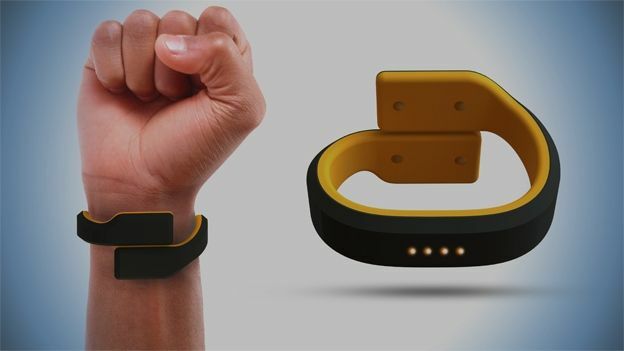 The smartband, created by Indian-American Maneesh Sethi, will pump a mild electric current into your wrist if you fail, for instance, a work deadline or a fitness goal. "Essentially, it's a wristband that electrocutes you into submission action," says Sethi. Users program the device to set up their own goals, for instance stopping snooze-bashing on early morning alarms. The user then assigns a referee that receives a text if you fail. You also get a shock, and a small fee charged to your bank account, courtesy of the Pavlok app. If users are successful in completing goals however, there's opportunity to win small prizes like money or lottery tickets, apparently. "The negative gets you started and the positive keeps the habit going,"saysSethi. The device is named after Ivan Pavlov, the Russian physiologist responsible for classical conditioning theory. Pavlov's work suggested that if we associate an act with a stimulus, the result is behavioural change. So if you're shocked every time you fail, you learn to stop failing. "Pavlok is the first bracelet designed to actually change your habits, and not just measure what you alreadydo," reads the device's website. "Pavlok integrates what you do with who you want to become, and helps you actually achieve the goals you want to achieve." We're not quite sure how the device tracks the various goals, but we imagine it will pair with other devices like alarm clocks, or use fitness tracking like pedometers or heart-rate tech. The crowd-funded device has raised backing to the tune of about £60,000, and looks likely to launch later this year, shipping with a £145 (approx.) price-tag. Just another day at the International Space Station.. Ever wondered what a water-blasting gatling gun looks like?